EVERTON don’t generally act rashly when it comes to managers, but despite their poor form this season, the most relevant factor in the disposal of Ronald Koeman may just have been the shifting sands at the club. Everton are under new management in the boardroom, with Farhad Moshiri owning almost 50% of the club. Bill Kenwright may be chairman and 12.2% stakeholder, but Moshiri gave Koeman his “full support” just three weeks before the Dutchman was sacked. At that point, the walls were closing in on Koeman. “He had to be sacked,” was the message from the top when the axe was wielded. Koeman led Everton to seventh place last season and Kenwright and Moshiri openly congratulated the players on a successful campaign. The loss of Romelu Lukaku was a double-edged sword, a big gap to fill on the field, but the funds could be invested in strengthening the team – or at least, that was the script. But Everton didn’t really replace Lukaku and the players they brought in have proved, by and large, to be disappointing. When you spend £ 133m, you expect results and Everton have been dismal this season. After years cast in the role of second-tier Premier Leaguers, there were hopes that a rejuvenated team could make a push for a higher place. There was a degree of expectation that may have been missing in previous years. Koeman’s record at Everton showed a win rate of 41.4%, which was presumably much better before 2017-18’s results. That’s better than many past Everton managers and only marginally worse than David Moyes and Roberto Martinez. But after a good home record in 2016-17, in which they won 13 of their 19 Premier games and lost just three, Everton’s form has been disastrous at Goodison, three league defeats already. 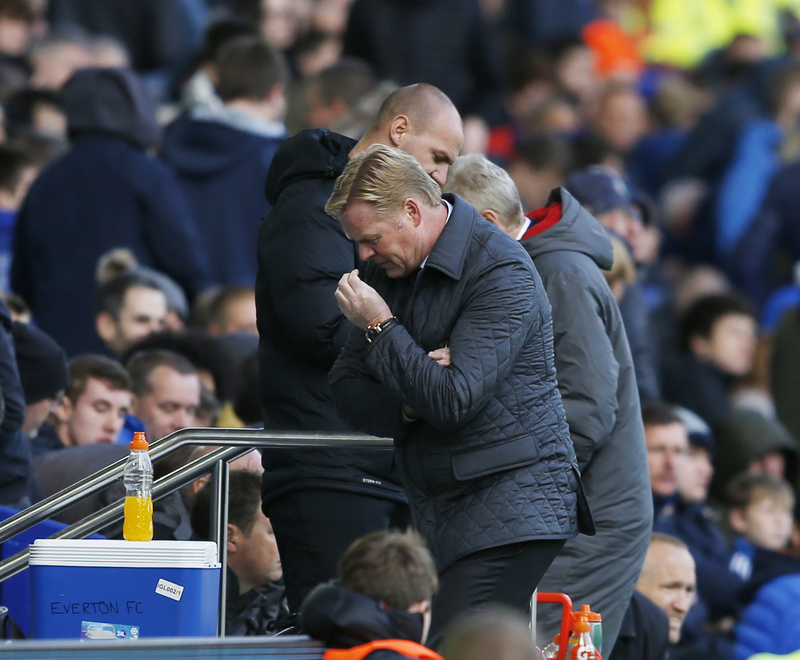 The way Koeman’s side capitulated against Arsenal, after being 1-0 up, was the final straw. Not many of Koeman’s signings have made an impact. Wayne Rooney, who was supposed to be the old hand who could motivate his team-mates, has scored four times and has done better than many anticipated. Rooney is not the future, though. Of the new signings, goalkeeper Adam Pickford has been impressive, but the others have failed to make a strong or consistent impact. Michael Keane, a £25m signing from Burnley, started well, but has tailed off, Davy Klaassen, signed from Ajax, has looked physically challenged at times, £40m signing Gyfli Sigurdsson has lacked full fitness and others like Cuco Martina and Sandro Ramirez have been found wanting. One of the more promising players has been Nikola Vlasic, who was picked up from Hajduk Split. There has been criticism that the new players have been bought without much thought to team building, that they lack cohesion. That’s not a good way to dispose of £ 130m-plus. Everton have never spent so prolifically for a long time – they were once the ‘Bank of England’ team – and it is likely that the Goodison power curve may have demanded instant results. Surely, they would have envisaged a better show in Europe, which looks set to end in tears. Having got back into the Europa League, Everton’s performances have been very tepid, losing two of their three group games already and failing to win either of their home ties. While nobody could have been too surprised by Koeman’s dismissal, it does show that tolerance levels have changed at the club. In 20 years, Everton have had fewer managers than Liverpool, Chelsea, Manchester United, Arsenal, Tottenham and Manchester City. At the same time, Everton have been the most uneventful club among the 20 current members of the Premier League. Their last “success” (title, promotion or cup win) was in 1995 when they won the FA Cup. Since then, the only notable event was their 2009 FA Cup final defeat. They are the only club among the 20 current top flight not to have something to celebrate in the 21st century. With Koeman gone, will another big name (he is highly regarded across Europe) be lured to Goodison. Ancelotti? Tuchel? Benitez? Who knows, but one thing is clear, Everton are craving success – it is long overdue and whoever gets the job may experience pressure like no other post-Premier manager at the club.